Whether it’s a New Year’s resolution of yours to finally get fit or whether for some other reason you’re ready to seriously change how you feel and how you look, the Bowflex Blaze Home Gym is the machine for you. The Bowflex Blaze offers Power Rod Technology Resistance, upgradeable to 310 or 410 lbs which means this piece of fitness equipment can grow with you as you get fitter or it can handle multiple exercisers with multiple fitness levels. With a capability for 60 exercises, this machine will work all of your body’s muscle groups, offering visible results from the workouts challenging your mind and body. What Makes the Bowflex Blaze Home Gym a Good Buy? The Bowflex Blaze, since it targets of all the muscle groups with its 60 exercises, is a multi-purpose piece of fitness equipment. It might be one piece of equipment but it offers the capacity of a whole gym. The Blaze is a machine that looks good enough to put in any room of the house. The Bowflex Blaze will help you realize your fitness goals. It will help you build muscle. Just with the 20 minute/3 times a week recommended program, you can build your strength and resistance which will develop muscle and, the more muscle you have, the more calories your metabolism will burn. You can also do cardiovascular exercises on the Bowflex to meet fitness goals and/or incorporate aerobic conditioning. This special Bowflex technology challenges the body by providing resistance that doesn’t hurt or feel uncomfortable. It eliminates joint pain associated with strength training and causes less overall strain on the body than using free weights. The Power Rod units themselves come with Bowflex’s lifetime guarantee because they will never burn out as they have been developed to ensure durability throughout a lifetime of use. With the Power Rod Technology, the machine itself can be adjusted from 210 lbs to 310 or 410 lbs so that it can grow with you. Drawbacks to the Bowflex Blaze Home Gym? Height Limitations: For individuals 6’4 or taller, not all of the exercises can be performed with optimal Credit: http://www.amazon.com/Bowflex-Blaze-Home-Gym/dp/B000GRDS6U/ref=sr_1_1?ie=UTF8&qid=1324070586&sr=8-1 comfort. If you are tall, there may be some exercises you cannot do with the Bowflex Blaze. Cable extenders, purchased separately, will enable you to do all of the standing exercises. Resistance: The Power Rods are safe and comfortable but are not as “weighty” as free weights. For serious bulking up, particularly for your legs, you might have to purchase upgrades offering more resistance for leg workouts and bench presses. On the other hand, if you want to use the Bowflex Blaze for toning, then less resistance with the standard rods will work for you. Is the Bowflex Blaze Home Gym Worth It? With over 30 five-star reviews, the Bowflex Blaze Home Gym is a wonderful value, according to the owners of the fitness machine who have reviewed it on Amazon. And why shouldn’t they be happy with their purchase? 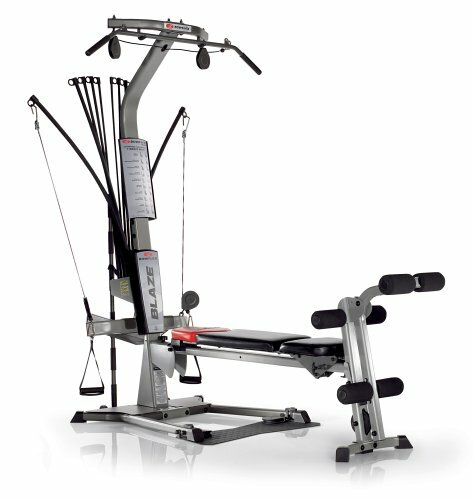 It is a sleek machine combining several strength training machines into one in terms of function with the state of the art technology guaranteeing value and durability. While it doesn’t offer a full range of cardiovascular exercises (and so you might need a treadmill or elliptical machine for extended aerobic conditioning), the Bowflex Blaze can be used for all of your strength workouts. You won’t have to go to the gym anymore and it is much safer than lifting on your own. In short, this is the machine that will safely and thoroughly help you to get into the shape of your life.